Amla has more vitamin C than orange. Apart from this, there are many nutrients in it that are beneficial for health. Make small pieces of amla. Grind the pieces and prepare its juice. Heart Problem: The consumption of amla juice reduces cholesterol. This is beneficial in avoiding heart problem. Joint Pain: Amla juice has anti-inflammatory properties. It is beneficial in knee pain as well as joint pain. Urine Problem: Amla juice has diuretic properties. It is beneficial to avoid urine related problem. Digestion: Amla juice has high amount of fiber. This improves digestion. It is effective in avoiding constipation. Skin Problem: The consumption of amla juice removes toxins from the body. This increases shine of the face. It is beneficial to make hair thick and black. 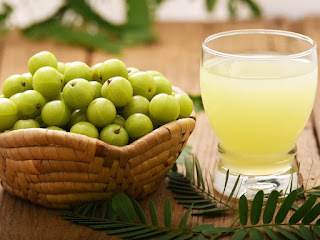 Weakness: Amla juice has high amount of vitamin C. It helps to avoid weakness. The consumption of amla juice gives instant energy. Weight: The daily consumption of amla juice improves metabolism. This reduces weight.